, an English divine, and laborious writer, was born of reputable parents, at Hunmanby near Scarborough in Yorkshire in 1671. In his education he was much encouraged by his uncle the rev. Mr. Fiddes of Brightwell in Oxfordshire, who was as a father to him. After being instructed at a private school at Wickham in that neighbourhood, he was admitted of Corpus Christi, and then of University college, in Oxford; where by his parts and address he gained many friends. He did not, however, continue there; but, after taking a bachelor of arts degree in 1693, returned to his relations, and married, in the same year, Mrs. Jane Anderson, a lady of good family and fortune. In 1694, he was ordained priest by Dr. Sharp, archbishop of York; and not long after, presented to the rectory of Halsham in that county, of about 90l. per annum. 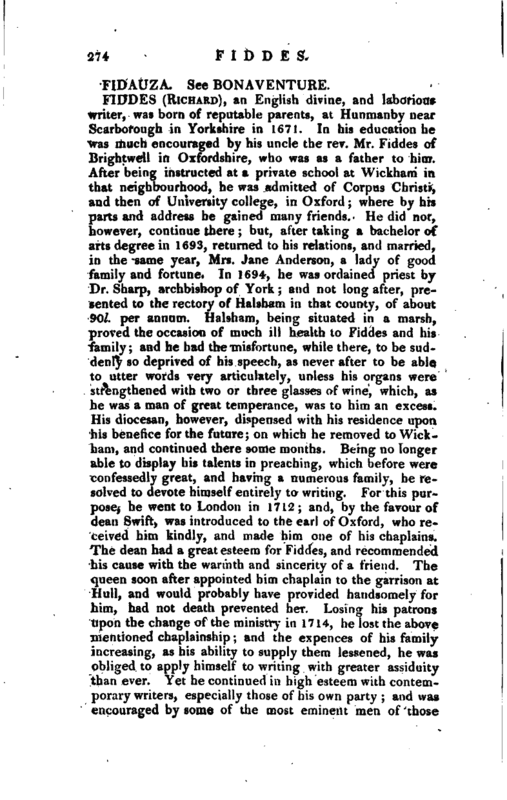 Halsham, being situated in a marsh, proved the occasion of much ill health to Fiddes and his family; and he had the misfortune, while there, to be suddenly so deprived of his speech, as never after to be able to utter words very articulately, unless his organs were strengthened with two or three glasses of wine, which, as he was a mun of great temperance, was to him an excess. His diocesan, however, dispensed with his residence upon his benefice for the future; on which he removed to Wickham, and continued there some months. Being no longer able to display his talents in preaching, which before were confessedly great, and having a numerous family, he resolved to devote himself entirely to writing. For this purpose, he went to London in 1712; and, by the favour of dean Swift, was introduced to the earl of Oxford, who received him kindly, and made him one of his chaplains. 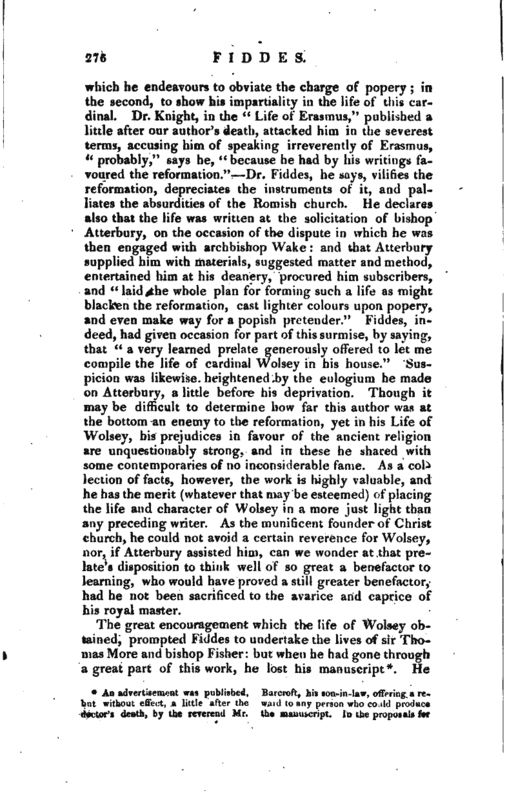 The dean had a great esteem for Fiddes, and recommended his cause with the warmth and sincerity of a friend. The queen soon after appointed him chaplain to the garrison at Hull, and would probably have provided handsomely for him, had not death prevented her. Losing his patrons upon the change of the ministry in 1714, he lost the above mentioned chaplainship; and the expences of his family i icreasing, as his ability to supply them lessened, he was obliged to apply himself to writing with greater assiduity than ever. Yet he continued in high esteem with contemporary writers, especially those of his own party; and was encouraged by some of the most eminent men of those | times. 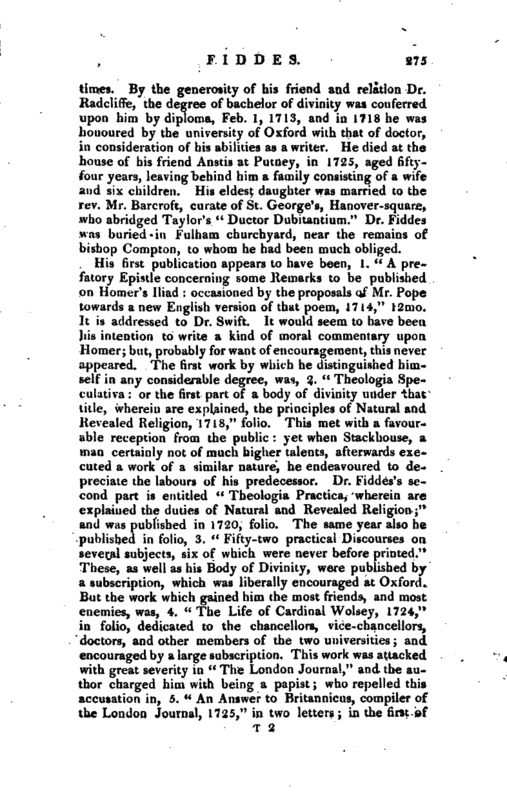 By the generosity of his friend and relation Dr. Radcliffe, the degree of bachelor of divinity was conferred upon him by diploma, Feb. 1, 1713, and in 1718 he was honoured by the university of Oxford with that of doctor, in consideration of his abilities as a writer. He died at the house of his friend Anstis at Putney, in 1725, aged fifty ­four years, leaving behind him a‘ family consisting of a wife and six children. His eldest daughter was married to the rev. Mr. Barcroft, curate of St. George’s, Hanover-square, who abridged Taylor’s “Ductor Dubitantium.” Dr. Fiddes was buried in Fulham churchyard, "near the remains of bishop Compton, to whom he had been much obliged. His first publication appears to have been, 1. “A prefatory Epistle concerning some Remarks to be published on Homer’s Iliad: occasioned by the proposals of Mr. Pope towards a new English version of that poem, 17 14,” 12mo. It is addressed to Dr. Swift. It would seem to have been his intention to write a kind of moral commentary upon Homer; but, probably for want of encouragement, this never appeared. The first work by which he distinguished himself in any considerable degree, was, 2. “Theologia Speculativa: or the first part of a body of divinity under that title, wherein are explained, the principles of Natural and Revealed Religion, 1718,” folio. This met with a favourable reception from the public: yet when Stackhouse, a man certainly not of much higher talents, afterwards executed a work of a similar nature, he endeavoured to depreciate the labours of his predecessor. Dr. Fiddes’s second part is entitled “Theologia Practica, wherein are explained the duties of Natural and Revealed Religion;” and was published in 1720, folio. The same year also he published in folio, 3. 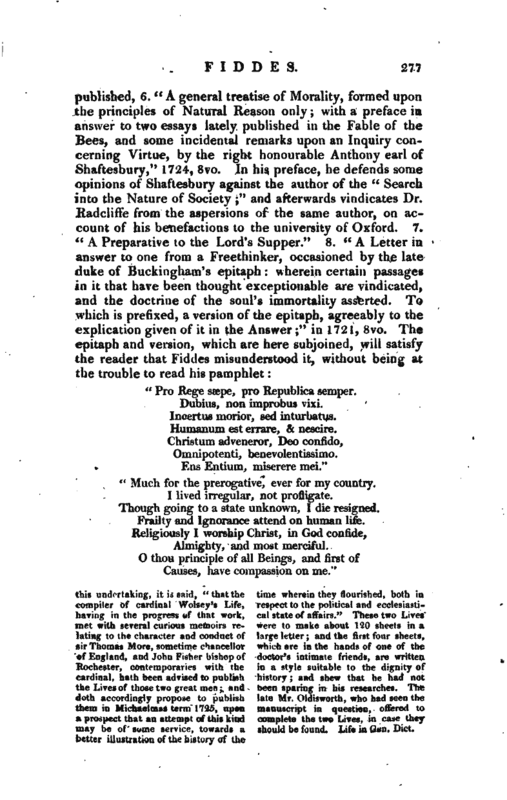 “Fifty-two practical Discourses on several subjects, six of which were never before printed.” These, as well as his Body of Divinity, were published by a subscription, which was liberally encouraged at Oxford. But the work which gained him the most friends, and most enemies, was, 4. “The Life of Cardinal Wolsey, 1724,” in folio, dedicated to the chancellors, vice-chancellors, doctors, and other members of the two universities; and encouraged by a large subscription. 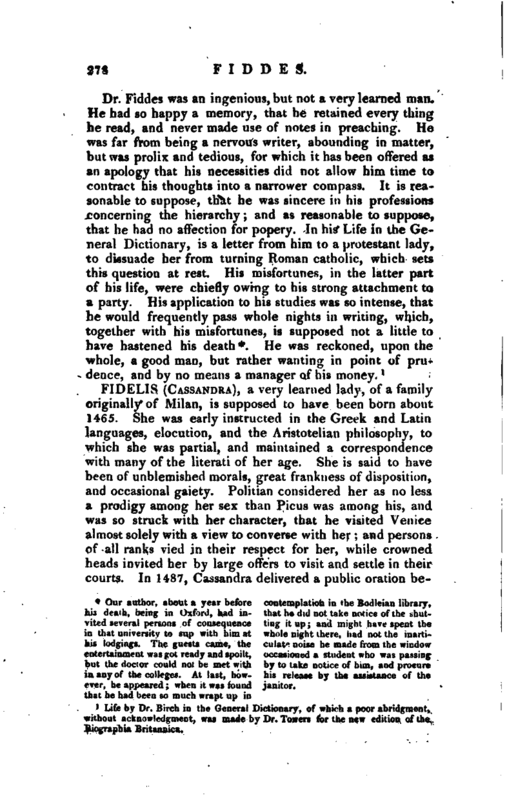 This work was attacked with great severity in “The London Journal,” and the author charged him with being a papist; who repelled this accusation in, 5. “An Answer to Britannicus, compiler of the London Journal, 1725,” in two letters; in the first of | which he endeavours to obviate the charge of popery; in the second, to show his impartiality in the life of this cardinal. Dr. Knight, in the “Life of Erasmus,” published a little after our author’s death, attacked him in the severest terms, accusing him of speaking irreverently of Erasmus, “probably,” says he, “because he had by his writings favoured the reformation.” Dr. Fiddes, he says, vilifies the reformation, depreciates the instruments of it, and palliates the absurdities of the Romish church. He declares also that the life was written at the solicitation of bishop Atterbury, on the occasion of the dispute in which he was then engaged with archbishop Wake: and that Atterbury supplied him with materials, suggested matter and method, entertained him at his deanery, procured him subscribers, and “laid the whole plan for forming such a life as might blacken the reformation, cast lighter colours upon popery, and even make way for a popish pretender.” Fiddes, indeed, had given occasion for part of this surmise, by saying that “a very learned prelate generously offered to let me compile the life of cardinal Wolsey in his house.” Suspicion was likewise heightened by the eulogium he made on Atterbury, a little before his deprivation. Though it may be difficult to determine how far this author was at the bottom an enemy to the reformation, yet in his Life of Wolsey, his prejudices in favour of the ancient religion are unquestionably strong, and in these he shared with some contemporaries of no inconsiderable fame. Asa collection of facts, however, the work is highly valuable, and he has the merit (whatever that may be esteemed) of placing the life and character of Wolsey in a more just light than any preceding writer. As the munificent founder of Christ church, he could not avoid a certain reverence for Wolsey, nor, if Atterbury assisted him, can we wonder at that prelate’s disposition to think well of so great a benefactor to learning, who would have proved a still greater benefactor, had he not been sacrificed to the avarice and caprice of his royal master. this undertaking, it is said, “that the compiler of cardinal Wolsey’s Life, having in the progress of that work, met with several curious memoirs relating to the Character and conduct of sir Thomas More, sometime chancellor of England, and John Fisher bishop of Rochester, contemporaries with the cardinal, hath been advised to publish the Lives of those two great men; and doth accordingly propose to publish them in Michaelmas term 1725, upon a prospect that an attempt of this kind may be of some service, towards a better illustration of the history of the time wherein they flourished, both in respect to the political and ecclesiastical state of affairs.” These two Lives were to make about 120 sheets in a large letter; and the first four sheets, which are in the hands of one of the doctor’s intimate friends, are written in a style suitable to the dignity of history; and shew that he had not been sparing in his researches. The late Mr. Oldisworth, who had seen the manuscript in question, offered to complete the two Lives, in case they should be found. Life in Gen. Diet. "Pro Rege saepe, pro Republica semper. Humanum est errare, & nescire. "Much for the prerogative, ever for my country. I lived irregular, not profligate. Though going to a state unknown, I die resigned. Frailty and Ignorance attend on human life. Causes, have compassion on me." Our author, about a year before his death, being in Oxford, had invited several persons of consequence in that university to sup with him at his lodgings. The guests came, the entertainment was got ready and spoilt, but the doctor could not be met with in any of the colleges. At last, however, he appeared; when it was found that be had been so much wrapt up in contemplation in the Bodleian library, that he did hot take notice of the shutting it up; and might have spent the whole night there, had not the inarticulate noise he made from the window occasioned a student who was passing by to take notice of him, and procure his release by the assistance of the janitor. Life by Dr. Birch in the General Dictionary, of which a poor abridgment, without the lament, was made by Dr. Towers for the new edition of the Biographia.